A series of debates, discussions, and lectures commemorating the conflict's bicentennial. 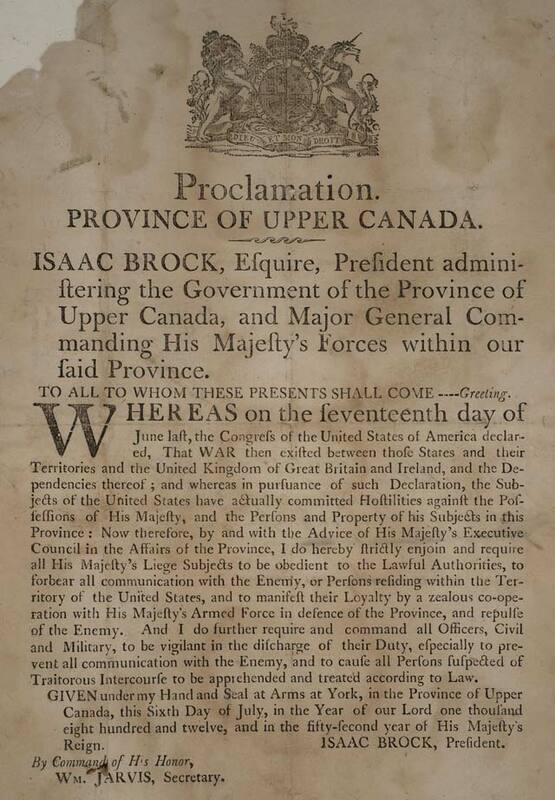 Proclamation issued by the Province of Upper Canada, 1812. Toronto Public Library. As the bicentennial celebrations surrounding the War of 1812 kick into high gear, you might wonder what all the fuss is about. For those curious about how the conflict affected all corners of present-day Toronto, or why the battles were significant in the development of Canada, the War of 1812: Bicentennial Talks program of discussions and lectures may provide answers. “Heritage Toronto was interested in an 1812-related lecture series,” notes Gary Miedema, the agency’s chief historian, “and was aware that the Royal Ontario Museum and the Toronto Public Library might be doing something as well.” After discussions with the administrator of the city’s 1812 bicentennial celebrations, each organization contributed events to the series; the project has also drawn in local historical societies and the Luminato festival. When considering how the War of 1812 affected what would become the City of Toronto, the focus is usually on the invasion of the Town of York, but the surrounding rural townships were hardly isolated from the conflict. Three of the lectures focus on these areas, including one we attended last week at North York Central Library about York Township. Genealogist Janice Nickerson presented her talk from the perspective of resident Sophia Playter five years after hostilities had ceased—choosing Playter because both her father and husband were tavern keepers, which might have made her privy to local gossip. It was an approach that lent a better sense of what someone’s opinion of unfolding events would have been. Nickerson began with a backgrounder on the township, which was bounded by the Humber River, Lake Ontario, present-day Steeles Avenue, and present-day Victoria Park Avenue. When the war began in 1812, only 750 people lived in the township. While Yonge Street was the main artery, it was a poorly maintained road full of hazards like boulders, mud, swamps, and tree stumps, which often made travel by foot as fast as horseback. During the war, farmers sold their excess crops to the militia for a tidy profit. Reunion of War of 1812 veterans at William Botsford Jarvis's home, Rosedale, October 23, 1861. Toronto Public Library. Loyalties within the township were not all on the side of the crown. Many early inhabitants were loyalists who migrated from the United States, and some still had family members there. As the war dragged on, there were thoughts that an American victory wouldn’t be a bad outcome—seven residents were charged with sedition. Nickerson noted that a speech given by Bishop John Strachan following the war—which attempted to persuade residents that they should be satisfied with the war’s resolution thanks to the survival of British rule, the rooting out of traitors, and healthy donations to the Loyal and Patriotic Society to support war victims and their families—didn’t impress those who thought the conflict was a waste of time and resources. While prices for crops collapsed and military pensions were suspended in the years following the war, the population grew and roads were improved. Disgust with the government grew as officials rewarded themselves with high salaries and seemed increasingly detached from the concerns of the local farmers. Sophia Playter could not have known that in 1820 the seeds of a rebellion that would take place nearly two decades later were already sprouting. The three lectures held so far have drawn a favourable response, with Denise Harris’s talk on Etobicoke’s role in the war having been booked at least four more times. “There is clearly an interest in the War of 1812 in general,” Miedema tells us, “and in how it affected this city.” Topics for the remaining talks include perspectives on Scarborough, the conflict’s impact on North America, and key figures like Isaac Brock and Tecumseh.